To be completely honest, we’re a little tired of the whistling that formed the hook of Peter Bjorn And John‘s 2006 international megahit “Young Folks.” Rest assured that the Swedish trio is beyond bored with it, too. Which is why they’ve gone and made Living Thing, their recently released fifth album and a strong indication that the acute pop minds behind breakthrough album Writer’s Block have much more to give. Despite its spare arrangements and instrumentation, Living Thing incorporates fuller melodies and more intricate sounds, ranging from dub to a sort of Merseybeat gone electro. MAGNET spoke to Peter Morén and John Eriksson (evidently, Bjorn Yttling was out on some unreachable fjord) about hitmaking, hip hop and the “beer meetings” that brought Living Thing to life. 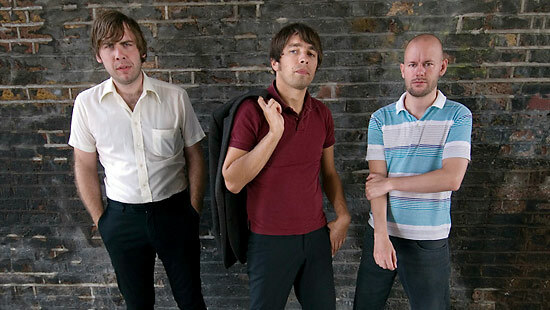 Peter Bjorn And John will be guest editing magnetmagazine.com this week. We look forward to their editorial beer meetings. 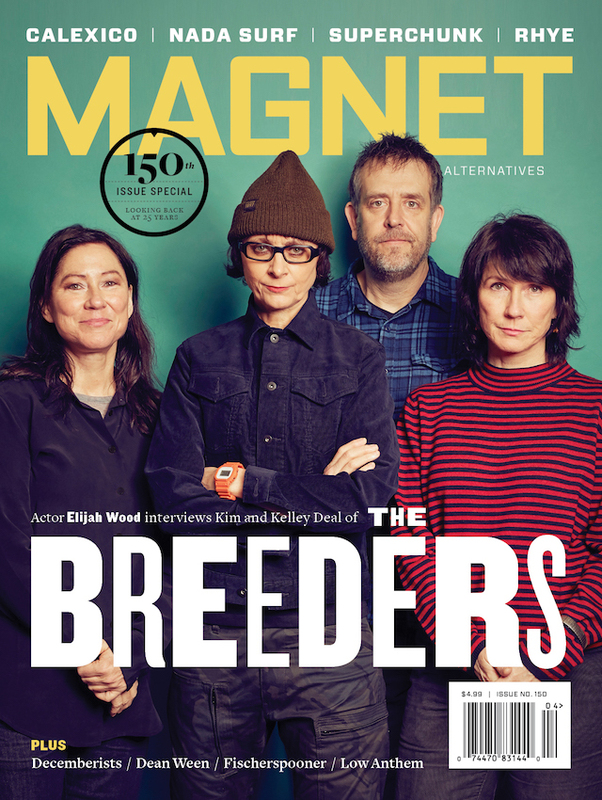 MAGNET: How was the order of whose names came first in your band decided? Age before beauty? Peter: When we decided to use our own names as the group name in 2000, we never even discussed it. It seemed natural, I guess, since at that point I wrote 60 percent of the material, sang it all and was the frontman onstage. Now we divide the writing three ways, so I only write around 33.3 percent. But I still sing most of them. But also it sounds the best; Bjorn, Peter And John? John, Bjorn And Peter? Nah, don’t think so. John: Someone said that we should call our band the Royal Frogpoprockers, and that sucked. So we took the Peter, Paul And Mary band name and tried to fit our three names into another good-sounding order. I thought about changing my name to Johnny, but John works OK.
Peter: Bjorn and I met at high school and we both wanted to form a pop band, so it seemed natural to do it together. I always saw a lot of talent in him, and I guess he saw something in me, too. But we were never best friends; it was more of a professional relationship and it still is. That’s probably why it works. The other members of that initial band drifted away, and suddenly it was just the two of us. We made some demos, but we knew we needed a proper drummer. Around 1999, we found John and he was the perfect missing link: a fantastic drummer who then, of course, turned out to be a great writer, too, even though it took until our third record for him to have the guts to show us some songs. Without John, it’s doubtful that Bjorn and I would still work together. We all have different (but wide) tastes in music and cover different stuff, so we complement each other, but at the same time are all open-minded enough to meet somewhere in the middle, on some sort of common ground. It also helps that we are all versatile and good musicians. We can play around with stuff, swap instruments and try all kinds of ideas. Also, we love just being three; it’s a challenge to make the most out of the small format, both live and in the studio, and we have a certain understanding when we play together. It’s a really special chemistry; not three individuals, but some kind of monster that you can’t control. John: Fortunately, I did not meet Peter or Bjorn in high school. When I first met Bjorn, I was drunk, and when I met Peter, he was mute. My second impression of the guys was that they were really serious about making pop music, and they have inspired me in many ways. Sometimes I feel like I am working with John Cale, John Lennon or John Norum, and they have transformed me from a John Cage to a John McClane or a John Cobra. On more than one occasion, I’ve read that you hold Young Marble Giants as an influence. How do you think their sparsity sits within the framework of your slightly lusher but still skeletal music? Peter: They have some similarity to hip hop and some Prince stuff in that; when they just use a couple of elements, they shine even more. You have to work more on those elements to make them really work, but it often makes the song more special and unique than if you just randomly staple chords. We especially worked with that aesthetic in mind for “Blue-Period Picasso”; I play the bass on that, and the engineer and I really worked to make it YMG funky and plonky. I remember Bjorn came in when I’d just finished that overdub and was delighted with the sound. I like economy in lots of genres, like the guitar playing of rockabilly and later Steve Cropper. But I also love ELO, so I’m not a one-trick pony. We might do something really overblown someday. I love classic guitar rock when everyone is playing all the time, too. John: The idea of sparse instrumentation is something we have worked on for a long time, but it’s hard for us to be dogmatic, and we often end up with a bit more sound flavors then we first intended. I guess that’s our style. But I would love to make an album built out of just three sounds on each song. Maybe next time. You’d been around for several years before Writer’s Block broke big. Would you say you suffered an anxiety or two as to where your career was going before then? Peter: It was frustrating making records that you cherished and loved and seeing them not going anywhere. We all had different day jobs, and it was hard to focus on the band, too. We played small gigs now and then in Sweden and Norway and it was fun, but it still didn’t seem like it was going to happen. And we weren’t teenagers. When the second album Falling Out came out, I was 28, and I was really, really proud of it. Still am. I think it’s a very special soulful record, and it might be my favorite PBJ record in certain ways. So when that got exactly the same OK but lukewarm reviews as the first, even though it felt like a vast improvement and didn’t sell, it was tough. We kind of gradually gave up on making it in this business. It was also hard since we were on a one-man indie label, so essentially we did all the record label work, too, apart from distribution. And Sweden is a mini-market anyway. But we didn’t have any skills or contacts to put us in touch with any good foreign labels. I went back to university to become a librarian and saw music as a hobby again. And when we made Writer’s Block in Bjorn’s little home studio, we said that if a slightly bigger label would not take care of it, then we wouldn’t really care what happened with it. But then V2 picked it up, and they had contacts with Wichita in the U.K., and that started the ball rolling. Also the timing was crucial. MySpace and a lot of the music blogs came at the same time as “Young Folks,” and the Internet hype was really important for us. It made the world smaller and us the international band we always wanted to be. John: Just anxiety of flying. When somebody whistles “Young Folks,” what’s the first then last thing that comes into your mind? Peter: First, it annoys me. Then I think about everything I have to thank that song for. A career and some wealth. Not bad things. My favorite thing that so many bands do with their early hits is to rearrange them into something else—something goofy or trend-conscious. What do you imagine as a possible reconfiguration of “Young Folks”? Peter: It already has got a good funky groove, so I think we should develop that a bit more. I ad-libbed some soul chanting and falsetto recently and some verses from Sam & Dave, so that’s a good direction. Bongo and bass solo! John: I don’t think we can take credit for bringing whistling back into music, but half a year after “Young Folks,” every stupid Swedish commercial about dog food, mopeds and miniature corn had whistling on it. That made me crazy. How do you feel about being appropriated by Kanye West? And what’s not to say all these young Scandinavians got turned onto Kanye courtesy of you? Peter: I don’t know anything about hip hop, but John likes the more alternative stuff like J. Dilla and Madlib. Of course, I like some hits because I hear them on the radio and they might have a good rhyme or beat. But I’ve never bought a hip-hop record. I did buy The Last Poets the other week, so that comes close. What I do love is old soul, funk and disco from the ’60s and ’70s. The stuff they sample. I listen to that all the time. So I understand the meaning of a good groove. If hip-hoppers get into our stuff and sample it, I feel proud, because it puts me in the same box as William Bell and Curtis Mayfield—not bad company. And all people should open their ears and listen to stuff they don’t usually try, so if we build some bridges, it’s awesome. There seem to be a lot of drum machines on the new album, more than before. Peter: That’s a common misunderstanding that there a lot of drum machines on this one. There actually isn’t. I think there is one single sound that we lifted from an ancient analog machine. The rest are stuff like popping of balloons, knives, banging film cans and matchboxes, ripping paper, bottles and tapping your fingers against a piano. And handclapping and some traditional percussion instruments, of course. If they sound anything like machines, it’s because of effects and maybe that we mix them up in the computer. But this is actually a very acoustic record. And everything is played live onstage, too. John has the sounds on his sampler pads, but it’s triggered and played by him. We hate backing tracks because we like to play around and improvise with the songs onstage. John: 85 percent of the drum sounds are acoustic sounds that we worked on so they would sound electronic. The only few electronic drum sounds are from a Yamaha RY30 that we connected to a Rex 50 guitar effect pedal. We created a library of our own sounds; maybe we will build our own PB&J drum machine in the future. Lyrics like “I’m losing my mind/That’s why I ain’t fine” is pretty desperate stuff. Were you three genuinely feeling at loose ends while recording Living Thing? Peter: I think the atmosphere was better than ever, very creative and loose. And the fact that we recorded the instrumental record, (2008’s) Seaside Rock, was really important. That helped us to not think about pressure and more about the reasons we are into making music; basically that we want to and are good at it. But, of course, some of the songs are old and that might have been written during a depressing tour or something. Touring can be rough. But songwriting works like a shrink. You talk about your problems when you write the song, and then when you record it, you might be happier than ever. John: At some points at the end of the creation of the album (before we had fruit and nuts in the studio), we almost lost it. But not because we had trouble making music. The thing was that, after a beer meeting, we almost ended up doing a double album. We had more than 20 songs and could not decide what to do since all of the songs were so great. But after another beer meeting, we skipped that idea. What’s the angry motivation behind “Lay It Down”? John: The motivation comes from the feeling that maybe 50 percent of the people in the world experience. A good friend takes the girls you are in love with over and over again without showing any feeling of regret. But you can also look at the lyrics in a different way and sing the song to yourself, if you want. Is there ever the feeling among you that one is siding with the other too often? Peter: Musically, I sometimes feel like I just want to let loose and play some good old rock ‘n’ roll while the other two want to fly to Mars and collect some weird space dogs and cut them apart in a lab. Like a good song ain’t enough. And that sometimes makes me bored. Like I felt when kids were playing computer games and talking about phony sci-fi movies at school, and I would rather read a comic or watch a black-and-white-matinée. But then I play some great rock ‘n’ roll with some other friends and I start to miss the experimenting. I need both. And you can’t honestly be a Beatles fan and not like experimenting. Also, I’m like a free-jazz/freakbeat guy live sometimes, so that’s where I really live out my avant garde side. We honestly bring out the best in each other. John: Since we are three dictators in a working crazy democracy, we are aware of this, and I think our fights and mind games create a very unique energy that we play around with and use as fuel for making music. John: One of the most important parts of our process are the moments when we don’t think that much and all work together. We are all great at improvisation, and when we connect our brains to each others’ when we rehearse, play and record, great stuff happens. And actually, these moments tend to happen more and more often. What will you three do to make Depeche Mode’s days more joyful or hateful on your tour this summer? Peter: Play loud and good and eat their catering. John: We will play as good and soft as possible, then we will ask them how they manage to continue working together year after year. And when they have given us the ultimate answer, we will stay out of their dressing room. What do you each want from all this living? Peter: Make more music in all kinds of fields. And raise a family. And more guitars on the next PBJ record. John: More music, friends and business class seats.